Irish building materials corporation CRH has become the second major European corporation to exit the Israeli market in the space of a week after it announced it has sold off its 25% equity stake in its Israeli operation Nesher Cement. 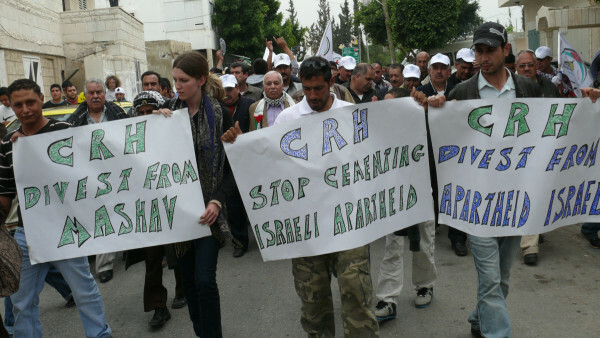 The boycott, divestment and sanctions (BDS) movement has been campaigning for CRH to sell its stake in Nesher Cement because it supplies cement used in the construction of Israel’s apartheid Wall and settlements on occupied Palestinian land, both of which have been declared illegal by the International Court of Justice. The decision mirrors the January 5 announcement by French corporation Orange that it it was to end its franchise agreement with Israeli telecoms company Partner following a high profile international BDS campaign protesting Partner’s support to the Israeli military and its involvement in illegal Israeli settlements. In March, the Irish Independent newspaper reported that CRH had placed its holdings in Nesher under review, seemingly in response to public pressure. More than 10,000 people signed a petition urging CRH to divest from Nesher and the Irish Palestine Solidarity Campaign repeatedly demonstrated at CRH annual general meetings in Dublin as part of a widely supported mass campaign. Campaigners made an official complaint about CRH to the OECD in 2012. “This is an important victory for Palestinians whose lives and livelihoods have been destroyed by the unceasing construction of the Apartheid Wall, which steals Palestinian lands, divides communities, destroys the social fabric and makes normal life impossible. In September 2015, French corporate giant Veolia sold off all of its businesses in Israel. This was a direct result of a 7-year campaign against its role in infrastructure projects for illegal Israeli settlements that cost it more than $20 billion in lost tenders and contracts. A leading France-based Israeli businessman recently told the Israeli media that the growing strength of the BDS movement means that most major European companies now avoid investing in Israel. Foreign direct investment in Israel dropped by 46% in 2014 as compared to 2013, according to a UN report, partially due to the impressive growth of the BDS impact, as stated by one of the report’s authors. The Israel Export Institute has revealed that Israel’s exports in 2015 have dropped by 7% over 2014. Moody’s, a leading credit ratings agency, has warned that “the Israeli economy could suffer should BDS gain greater traction.